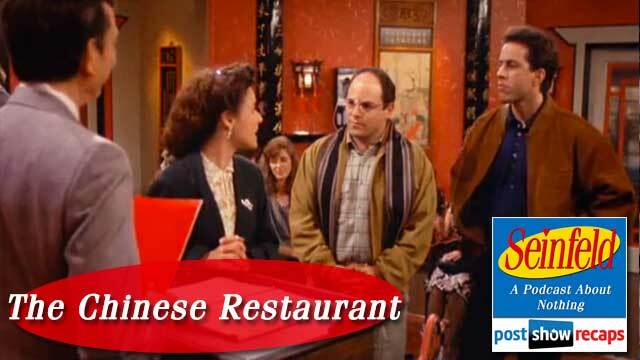 Akiva Wienerkur and Rob Cesternino couldn’t wait five, ten minutes to sit down and delve into the feast that was “The Chinese Restaurant”, which first aired in 1991 as part of Seinfeld’s second season. Rob started right off calling it a classic, while Akiva said he was excited to get to a great one after such clunkers. Both agreed that while classic, it was more fun and interesting than funny of an episode. Akiva equated it to some episodes of Louie. Before rehashing the episode, they discussed how having it shot in just one background, while also having it take place in real time were innovative moves for the time. Other notes that Akiva shared were that Kramer was absent from the whole episode because it was one of the first filmed in the season, and Kramer’s storyline was still that he was a hermit. Akiva saw a clip of Michael Richards talking about how disappointed he was to have not been in the episode, since it was so revered and groundbreaking. The standup portion to begin the episode had Jerry doing a bit about payphones, and how the operator sometimes calls back to request more money for the call. Neither Rob nor Akiva, who have both actually used a payphone in their lives, have ever heard of this happening. In the first scene, Jerry, George and Elaine walk into the Chinese restaurant talking about what the city needs. Jerry suggests that waste management and the police force should combine jobs so cops can be doing something when they aren’t fighting crime. They have trouble deciding how many they need to reserve for, since George’s date Tatiana may or may not meet them there. Rob wondered why George would pick this night to introduce her to his crazy friends. Meanwhile, Jerry is nervous about being out on the town since he cancelled plans with his uncle, but had to do it since Plan 9 From Outer Space is playing for one night only and can’t miss making sarcastic comments about the worst movie ever made (though IMDB would rate this movie a 3.9, while Rob Cesternino’s The Scorned earned a 3.0). Knowing they have a small window of time to eat before the show, Elaine wants to look at the menu while waiting, so they can order right away when they get a table. But Jerry says he can’t look at the menu until at the table. In debating this, Akiva said he’s one who will Google the menu of the place hours before to decide, while Rob felt there’s something to waiting until seated that makes sense. George starts to get agitated waiting for the payphone to call Tatiana, due to the man on the phone ignoring him. Akiva pointed out that this is really a 1991 problem. Akiva noticed how unusually large this waiting area is for a Manhattan restaurant, and wondered why they wouldn’t move along to another place, since there are 20 restaurants a block in NYC. Rob said that Larry David and Jerry came up with this episode from them waiting forever at a Chinese restaurant in Los Angeles, where they’d have to drive somewhere else instead of waiting. While George waits for the phone, Jerry notices a woman eating that he recognizes, but can’t tell from where. Elaine remarks how everyone always looks so happy when they are called to their table, like they’ve won something. George meanwhile, gets more and more angry about the guy on the phone. He asks Jerry if something happens, would he have George’s back. Rob felt that George was out of line here, and Akiva agreed that there really isn’t some kind of phone etiquette that was breached here. After scoffing at George about “rumbling” over the payphone, he asks him if he knows this woman he recognizes, since it’s driving him crazy. The guys started another debate about Elaine’s idea that the waiting area in a restaurant should be based on how hungry you are, and not who got there first. Both felt it would be quite difficult to quantify hunger, and bribery really would be the only way to expedite the process. After hearing Elaine complain about her hunger enough, Jerry offers her 50 dollars ($87.32 in 2014 according to the inflation calculator) to go up to a table and just eat an eggroll off of a plate without saying a word. Akiva and his wife had a similar circumstance where he could have asked for some untouched food from a neighboring table, and was close to asking for it before the waiter bussed it away. Rob felt that it would be too weird to ask for leftovers from other tables, and Akiva asked for the listeners to come up with some tips for how to handle this in the future. Elaine asks George what he thinks, and he replies that for 50 bucks, he’s stick his face in the soup and blow. She walks up to the table and tries to get the people to let her eat an egg roll, and she’ll give them half the money. The older patrons can’t hear her though, since she is talking through clenched teeth, and the plan fails. Akiva and Rob thought this was a poorly done scene, and that you couldn’t really tell if it was Elaine talking, or if her thoughts were dubbed into the scene. Back in the waiting area, George sees the payphone finally available but has it snatched away by another lady, who doesn’t care that he was waiting. He walks away yelling about how this is supposed to be a civilized society, which Rob really enjoyed. When the man who George was initially waiting for comes up and apologizes for taking so long, George politely accepts. Rob loved how just like last week, George backed down from the confrontation he had thought he wanted. George finally decides to share with Jerry why things with Tatiana are in flux right now. While fooling around after their date, George had “intestinal requirements” that couldn’t be taken care of in her apartment because the bathroom did not have a good enough “buffer zone” from the rest of the place. It becomes so strong that he has to get up and leave right in the middle of it all. Rob wondered why he would even start to fool around if this could have been a possibility. Akiva thought George should have just gone to the bathroom there, but Rob astutely pointed out that there’d be no denying the sound and the smell if things were really that dire for George. As they debated why George couldn’t have come up with a better excuse or lie to smooth things over instead of “I think it would be better if I left”, Rob and Akiva concluded that there was no happy truth, and no good excuse for George to leave in this situation. While still waiting for a table, the gang watches a boisterous, sleazy fellow walk in, make some sarcastic comments, then immediately sit down at a table. When Jerry asks why he gets a seat first, the host tells him that “Mr. Cohen is always here, and he’s from Park Avenue”. George finally gets to leave a message for Tatiana, then Jerry finally gets to figure out who the woman is that he recognizes. While talking with her, Elaine gets her name, which Jerry finally realizes that she’s a coworker of his uncle. Jerry frets about her telling him she saw him, blowing the excuse that he gave to his uncle to get out of going to dinner. Not anywhere close to being seated, they all decide that bribing the host would get the ball rolling. In dividing the money up, we get a classic cheap George moment when he chooses himself to put in $6, Jerry and Elaine $7. Jerry uses feminism to con Elaine into being the one to slip the host the money, but she does a terrible job getting him to notice the money at first, so she just yells at him, throws the money, and begs to be seated. Jerry then walks back over to get the money back, but that also fails miserably. This whole sequence further aggravates everyone, and they conclude that there is no way they can make the movie and eat there too. No suggestion Jerry comes up with works for anyone, and Elaine went so far as to say she’d rather lick the floor of the movie theatre than eat one of their hot dogs. Rob felt Elaine might have been a little to “precious” about it all, but he and Akiva both agreed that they’d have a hard time eating that hot dog too. While debating on what to do, the host starts yelling for “Cartwright”, which prompts George to double check if Tatiana called. The host tells him she just did, and that he yelled for Cartwright, which dumbfounds George. So they decide bail out on the restaurant and the movie after all the events. George is not in the mood and wants to go smooth things over with Tatiana, while Elaine is going to Sky Burger. As they walk out and shut the door, the host finally yells, “Seinfeld four!” The show ends with Jerry doing standup about how hunger might even bring someone to cannibalism. Rob put “The Chinese Restaurant” at the top of the episodes seen so far, and while Akiva agreed to that, he said it just didn’t crack his top twenty five list. They also both concluded that very little from this episode could work in 2014, since smart phones, texting, and Google would all take care of each of their issues. Since there was a quick turnaround between podcasts, there was no listener emails, comments or feedback to go over. Join the guys next week as they will discuss the last episode of season two called “The Busboy”. 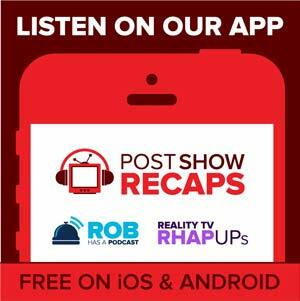 You can subscribe to the Seinfeld only podcasts or the main feed for Post Show Recaps by going to postshowrecaps.com. Don’t forget to leave questions and comments while there. You can also send emails to the guys at [email protected]. And if you haven’t already, do follow them on twitter @robcesternino and @keev26.